Alphabet letter crafts for centers, morning work, phonics instruction and interactive notebooks. Kids love these! Look no further for NO prep highly engaging alphabet learning activities. These downloadable printable alphabet letter crafts have preschool and kindergarten teachers raving! These super fun, super engaging printable ABC crafts feature cute letter characters that delight students while teaching letter recognition and phonics. Best of all, they are easy for teachers to implement in their classrooms. Click here to download these printable letter crafts. If you're looking to do alphabet letter crafts for your homeschool, preschool or kindergarten but DON'T have time to spend hours assembling construction paper and googly eyes, look no further! Home CEO's printable alphabet ABC Letter Crafts are a breeze to implement (just print and teach) and kids absolutely and completely love them! You simply print out the pages, kids assemble the ABC letter crafts and voila! This printable alphabet letter craft pack is not only great for teaching phonics but also to help develop cutting, pasting and fine motor skills. In addition to the 52 uppercase and lowercase alphabet letter characters you recieve in color and black and white versions, this printable alphabet letter craft pack also includes a title page, table of contents and a corresponding header so that you may paste them into an interactive notebook as a fun keepsake for your classroom and students. Alternatively, you may assemble these letter crafts on a construction paper base if you want to display them in your classroom. These popular printable alphabet letter crafts are used nationwide and in three countries. You're children will be eagerly asking for the next letter and you're going to love them! It is an engaging way to teach phonics and letter recognition. 100% of proceeds from our Home CEO educational products support over 20 charities helping the world in the areas of poverty, social justice, human trafficking, health research and more! Thanks to our customers in May 2017, we sponsored a playground to be built at a primary school, in partnership with East Africa Playgrounds! Learn more about who we support here. 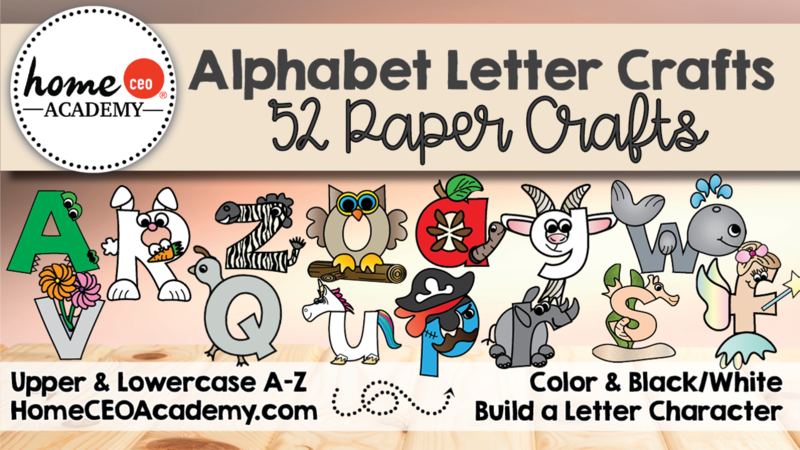 52 no-prep printable alphabet letter crafts (uppercase and lowercase) in PDF format. Available in color and black and white versions. Use year after year - kids love! Digital edition / PDFs. No product is mailed.